The listing below represents a guide of all the known archived MP3s publically available. These represent sound files documenting the station's audio history through the years. This registry is intended to be shared informational repository for archival purposes. Actual scoped and unscoped aircheck files are too large to be offered through this site directly. Therefore, see the box below to set up an exchange or use the discussion forum to set up an exchange with other 92.7 Archive guests and visitors. At this time, the Archive is looking to increase the size of its database resource, therefore only archived airchecks would be exchanged for some other aircheck not on the list below. However, one can exchange files in an effort to expand this registry compendium. To setup an exchange simply write to us at: The 92.7 Archive, P.O. Box 1711, Poughkeepsie, New York 12601 or send the webmaster an email using the contact form at the top of the page. If you have sent me an audio tape or you are awaiting to recieve a disc in exchange, you can check your package status by using the U.S. 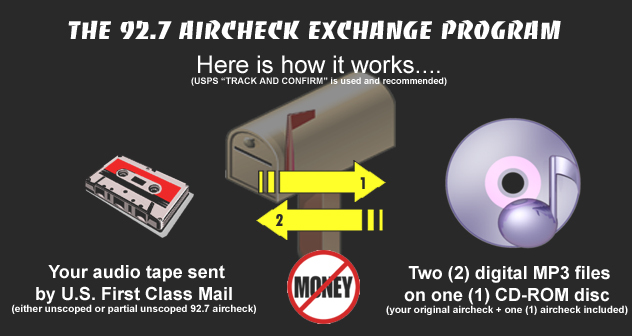 Postal Service "TRACK AND CONFIRM" link.